IIRMFW : Program and Reduce Lead Time. One of the key risk management controls for an Agile Risk Management Framework is to limit the amount and time between investment and return. A development organisation needs to deliver investments where the Lead Time and Weighted Lead Time are within agreed thresholds. Limiting the lead time also limits the financial value of inventory in the development organisation that is not delivering value to customers. 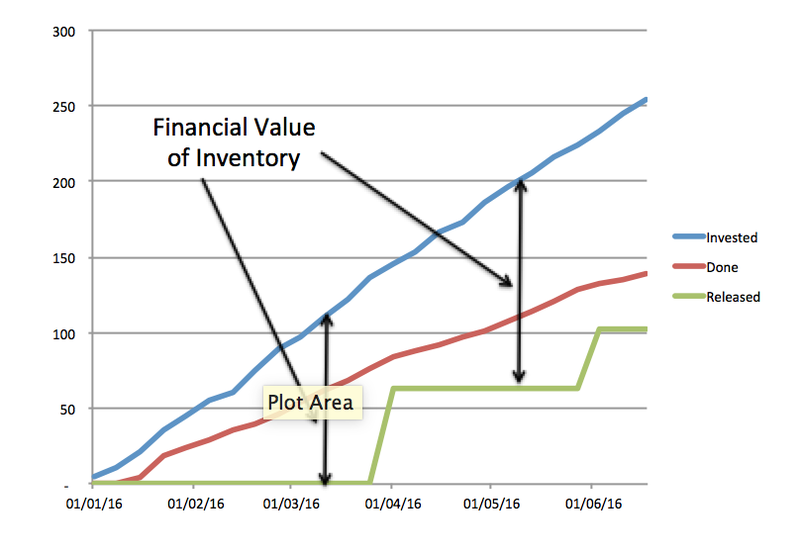 An organisation may limit both the lead time (or weighted lead time) and/or the financial value of inventory (See CFD below). RED – The investment is over the lead time (weighted lead time) limit. RED (Trending) – The investment is expected to breach the lead time (weighted lead time) limit. AMBER (Trending) – The investment might* breach the lead time (weighted lead time) limit. GREEN (Trending) – The investment is not expected to breach the lead time (weighted lead time) limit. Organisations in transition often struggle to make lead time targets. It is possible that the organisation might allow longer lead times provided software is delivered into a pseudo production environment, and that there is a commitment from executives across the entire value stream to achieve the target lead time within an agreed time period. * As indicated by a tool such as Troy Magennis’s Monte Carlo Simulation. This entry was posted on Monday, May 30th, 2016 at 3:55 pm	and posted in Uncategorized. You can follow any responses to this entry through the RSS 2.0 feed. Chris, thanks for sharing. This ideas seems like a good way to place focus on satisfying stakeholder’s needs early and often. Any insight on how to determine what an appropriate Lead Time target would be for various contexts? (I assume there isn’t one target that applies across the board. I suggest that every project should have the same constraint for lead time and weighted lead time. However, depending on where they start from, they may be given longer to achieve that target. They should demonstrate improvement of lead time and weighted lead time over time and be able to extrapolate that they will hit the target within the agreed timescale. The constraint is to determine that the project risk management is good enough to drop onerous waterfall SDLC deliverables. Obviously products need to reduce lead time well below one month if they want to survive in competitive markets. Chris Matts! This is genius. I am back at ThoughtWorks, and I am applying this today (!) for my client, and they will be impressed. I will of course credit you. Thank you!